New Paper “Trends In Precipitation And Temperature In Florida, USA” By Martinez Et Al 2012 | Climate Science: Roger Pielke Sr. Annual, seasonal, and monthly trends in precipitation, mean temperature, maximum temperature, minimum temperature, and temperature range were evaluated using stations from the United States Historical Climatology Network (USHCN) for the time periods 1895–2009 and 1970–2009 for the state of Florida. The significance and magnitude of station trends were determined using the non-parametric Mann–Kendall test and Sen’s slope, respectively. The collective, field significance of trends were evaluated using a Monte Carlo permutation procedure. Field significant trends in seasonal precipitation were found in only the June–August and March–May seasons for the 1895–2009 and 1970–2009 time periods, respectively. Significant decreasing trends in monthly precipitation were found in the months of October and May for the 1895–2009 and 1970–2009 time periods, respectively. Field significant trends were found for all temperature variables for both time periods, with the largest number of stations with significant trends occurring in the summer and autumn months. Trends in mean, maximum, and minimum temperature were generally positive with a higher proportion of positive trends in the 1970–2009 period. The spatial coherence of trends in temperature range was generally less compared to other temperature variables, with a larger proportion of stations showing negative trends in the summer and positive trends at other times of the year and more negative trends found in the 1970–2009 period. Significant differences in temperature trends based on the surrounding land use were found for minimum temperature and temperature range in the 1970–2009 period indicating that data homogenization of the USHCN temperature data did not fully remove this influence. The evaluation of trends based on station exposure ratings shows significant differences in temperature variables in both the 1895–2009 and 1970–2009 time periods. Systematic changes in trends can be seen in the 1980s, the period of widespread conversion from liquid-in-glass to electronic measurement, indicating that some of the differences found may be due to uncorrected inhomogeneities. Since notable differences were found between differently rated stations pre-1940, a time which the present-day rating should have little to no influence, attribution of differences based on station rating should be done with caution. ► Significant trends were found in precipitation, temperature and temperature range. ► More statistically significant trends were found for temperature than rainfall. ► Station exposure may influence temperature trends. Significant differences in most temperature variables were found between good and poorly sited stations based on the classification of USHCN stations using the USCRN rating system. whom Martinez et al 2012 cite. This work provides a preliminary analysis of historical trends in the climate record in the state of Florida. 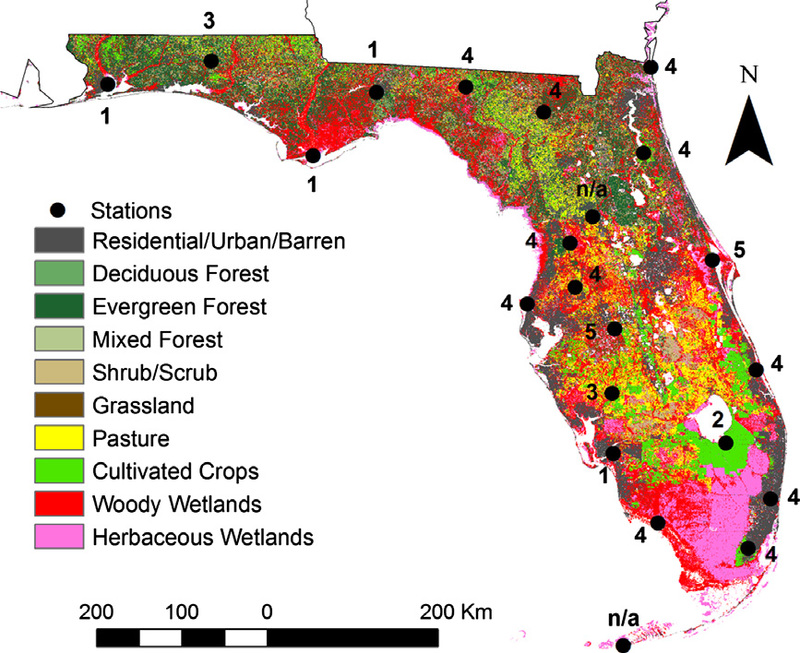 While this work did not attempt to fully attribute the cause of observed trends, it provides a first step in future attribution to possible causes including multidecadal climate variability, long term regional temperature trends, and potential errors caused by station siting, regional land use/land cover, and data homogenization. The U.S. Historical Climatology Network (USHCN, Karl et al. 1990) is a high-quality moderate sized data set of monthly averaged maximum, minimum, and mean temperature and total monthly precipitation developed to assist in the detection of regional climate change. they are really not as of as high a quality as claimed.